"Cloud ERP Software for manufacturing"
Cloud ERP for manufacturing is now becoming an integral part of the business operations of the major manufacturing concerns. A survey was conducted to investigate cloud ERP goals and benchmark performance of cloud based ERP implementations in light of the changing operational landscape for manufacturers. Moving to a subscription licensing and cost model, the ability to access anywhere, anytime, and always up-to-date software makes cloud deployment very attractive to manufacturers today. 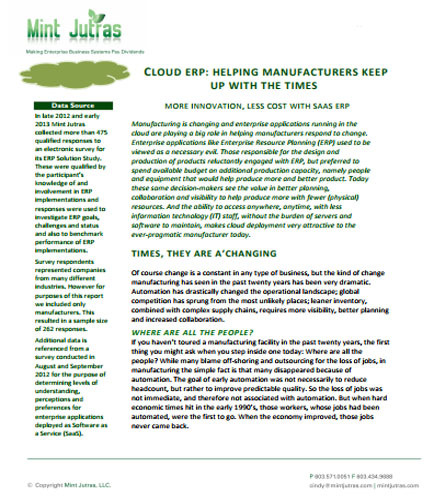 Read this white paper which looks at how cloud ERP solutions can aid innovation by providing better planning, collaboration and visibility to manufacturing companies to help them produce more with fewer physical resources.